Chassis no. GIIAYO786E5100034 - Engine no. A concept car built on C4 Chevrolet Corvette chassis. 1984 Los Angeles Auto Expo' show car, 1985 Car Design Award winner. 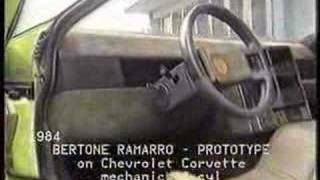 In 1984, the Chevrolet Corvette Ramarro was marked by highly innovative architecture; Bertone made significant changes on the chassis (the engine radiator was moved to the rear, and the weight distribution conditioned the avant-garde conception of the vehicle on both styling and constructions points of view; the doors, for example, opened by sliding forwards while the roof was devised with a transparent monolithic dome which hid the pillars. The Ramarro project, which aroused considerable interest in 1984 among supercar enthusiasts, sent a sensational message to manufacturers of front engined automobiles. Displayed at the Los Angeles Auto Expo in 1984, the Ramarro won the following year the Car Design Award, judged by a jury composed of the most important specialised American and European magazines.